Chan-Kiek Village, Kampong Chhnang province. Photo by Dr. Eng Kok-Thay. So Farina joined the Documentation Center of Cambodia (DC-Cam) since 2003. She now heads DC-Cam's Cham Oral History Project, which records experience and preserves memory of the Cham Muslim community under the Khmer Rouge regime (1975-79), with three main objectives: Memory, Justice, and Education. Farina holds a B.A. in Accounting and Finance from National Institute of Management (NIM), and an M.A. in International Affairs with a concentration in Southeast Asian Studies from Ohio University (USA). In 2005, she received training in Indonesia on women and Islam. In 2007, she attended Columbia University (USA) oral history summer institute, which focused on documenting human rights abuses through oral history. She is currently pursuing her Ph.D at the University of Massachusetts, Lowell (UMASS). 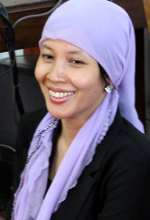 Farina's researched monograph published in 2011, “The Hijab of Cambodia: Memories of Cham Muslim Women after the Khmer Rouge," which was drawn from her master's thesis, focuses on Cham Muslim women's experiences under the Khmer Rouge. This book examines women’s experiences through the complexities of memory and narrative and their role in transitional justice. Farina attented international conferences and meetings related to genocide, oral history, Islam in Southeast Asia, memorialization, information and technology, truth commissions and access to justice for women in Bangladesh, Thailand, South Korea, Germany, Malaysia, India, Kenya, and Indonesia. Farina also contributed to Searching for the Truth magazine, Oxford Islamic Studies Online, Oxford Encyclopedia of Islam, and newspaper articles about Cham Muslims, women and oral history. Farina is currently doing her research on Cham Muslims in Malaysia and Thailand under the support of Asian Public Intellectuals (API) fellowship. While there are biological differences between men and women, the status, relationships, and roles of men and women in society are socially constructed. This means that each society assigns roles and structures relationships between men and women. This social construction is based on beliefs, traditions, and customs. As societies change over time via internal and/or external forces, the concept of gender can change, too. Along with a changing understanding of gender comes a change in the roles and relationships between men and women. While gender discrimination remains an issue throughout the world, the Sleuk Rith Institute recognizes that some countries and organizations have made more progress than others. The Institute will look to these countries and organizations for guidance and leadership as they seek to counteract the social construction of gender prevalent in Cambodia. Change in the conceptualization of gender at the societal level is gradual and may take several generations or longer, but nevertheless the concept of gender and its societal manifestations (roles and relationships) are flexible. The Institute recognizes that this process takes time and therefore is making a long term commitments to achieve full gender equality and zero discrimination within the Institute and throughout all of its projects.